More directly, the al-Shabaab terrorists pointed to Mr. Trump’s decision to recognize Jerusalem as Israel’s capital. “The Mujahideen carried out this operation … [as] a response to the witless remarks of US President Donald Trump, and his declaration of Al-Quds [Jerusalem] as the capital of Israel,” read the statement by Al-Shabaab, a Somali organization linked to Al-Qaeda, according to Reuters. The SITE Intelligence Group, which monitors jihadist groups, reported al-Shabaab released a photo of one of the attacker’s wearing a headband with text related to Jerusalem. 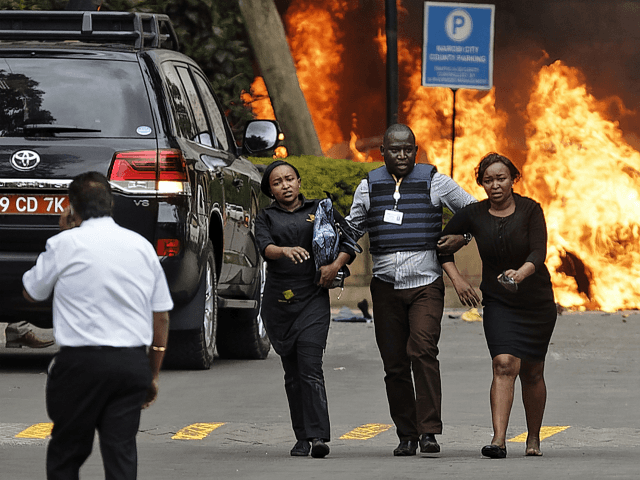 The extremist attack on a luxury hotel and shopping complex in Nairobi was perpetrated exactly three years after a high-profile al-Shabaab attack on a Kenyan military base in Somalia. National police chief Joseph Boinnet spoke late Wednesday after six more bodies were found at the scene, bringing the death toll to nine with another 28 wounded. The U.S. State Department confirmed one of the victims killed in the attack was an American citizen. The UK Daily Mail identified him on Wednesday as businessman Jason Spindler, CEO of management strategy and investment company I-DEV International, which has headquarters in Nairobi. A former Peace Corps volunteer who hailed from Texas, Spindler was working in Building 7 of the World Trade Center when al-Qaeda attacked on September 11, 2001.